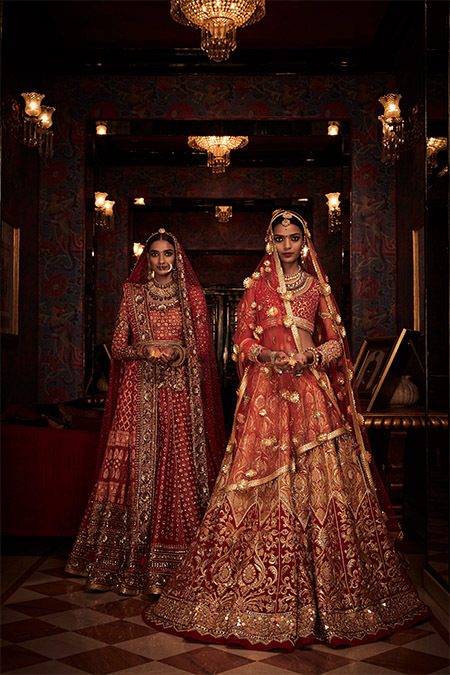 With the enchanting talent (among many others) of tailoring Indian, traditional textiles, and craftsmanship in blooming European silhouettes, Tarun Tahiliani has carved a distinct niche for himself to create wonderous bridal trousseaus over the last 27 years. He’s taken his time to discover and understand what modern brides want, ever since he was nudged into it. However, what Tarun’s been exceptionally good at is convincing his customers to believe in themselves, with confidence. With yet another collection, the designer has proved his aesthetic holds global identity and relevance. What inspired you to chase this celestial romance? We took inspiration from all things universe – constellations and stars being a core theme for the collection as it has a hint of romance and fantasy that leaves room to experiment with. We have also worked with elegant floral details and subtle Baroque-inspired work for our bridal couture 2017 collection. What kind of embroideries and textiles were used in this collection? There is a range of European colours on one hand, and then there are vibrant colours from the traditional Indian palette on the other side of the spectrum. 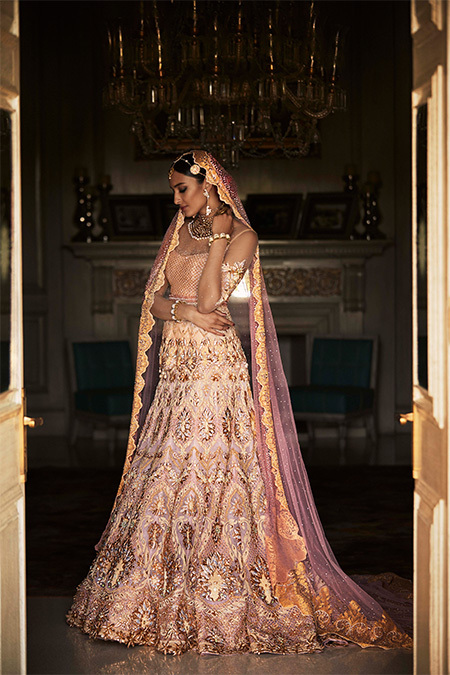 The designers have delicately used the elegance of Chantilly lace, rose-gold embroideries and crystals from Swarovski. How would you say you’ve contemporised the country’s rich, traditional craft in order to appeal to a newer and modern customer? Indians are on the cusp of a new way, which is a wonderful fusion of the two worlds our mind space inhabits. 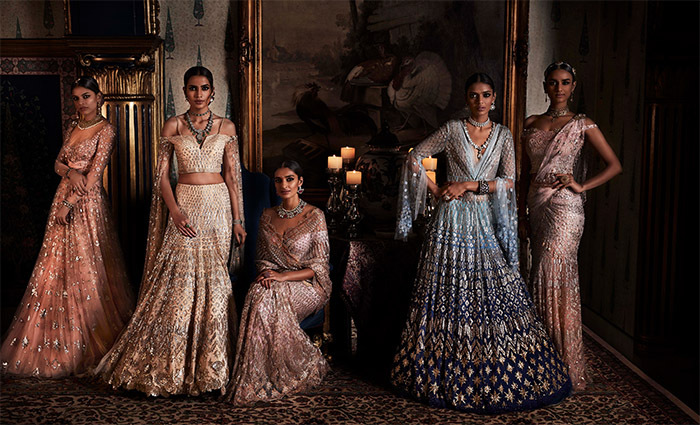 And this for me is the next big thing: where a confluence of ideas results in a contemporary Indian style that is not only ‘ethnic’ or ‘Western’ but has a global identity and relevance. Can you describe your creative design process? Great design is always a visceral process, it’s something that you filter through your own perception, your own view of the world at the moment. And out of this you will find a new voice a new message, a new pattern, a new motive. My creativity comes when I travel, marvel at art, architecture, interiors, history, Maharajas! Sometimes it’s from beautiful inlay work I’ve seen in a fabulous monument, other times my inspiration can be something as simple as a beautiful Kanjeevaram weave. Ultimately, however, my inspiration comes from India’s rich traditions of craftsmanship—particularly embroideries that we have in India. Nothing is more amazing than beautifully executed, intricate, fine technique. After having been in the business for 27 years now, how do you think your brand’s identity and aesthetic have evolved over time? I think in fashion one has to always balance one’s own ability to design with the fact that it has to find an audience and also the fact that people have to live their lives in the clothes. They don’t live in isolation, they have to get in and out of their cars, be able to sit, be comfortable. It works on many different levels. I can look at a painting on the wall and it can be disturbing or give me joy and it’s a very different kind of engagement than what one does with the clothes one wears, which is why fashion needs to have a very different kind of perspective. So I think we must live in the present and be fluidly modern. One can be traditional but I hate the idea of living in the past. Tomorrow must have freshness. 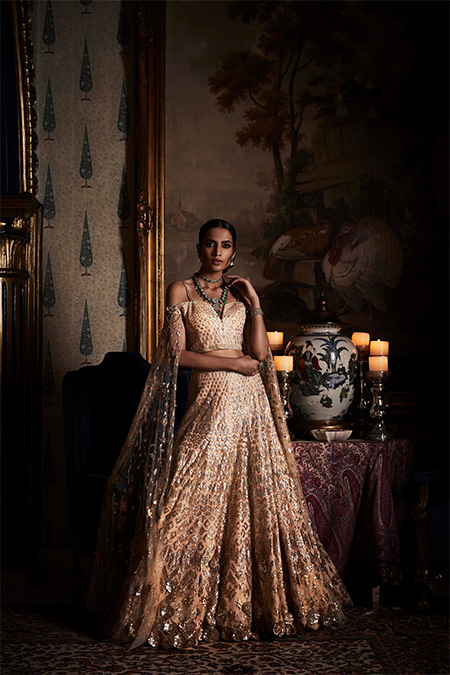 Our collections are inspired by the concept of ‘India Modern’. The textiles and the embroideries are traditional. Modern is the use of fit, pattern and construction and of course, the kinds of materials used. What inspired you at your recent visit to Textile India 2017? 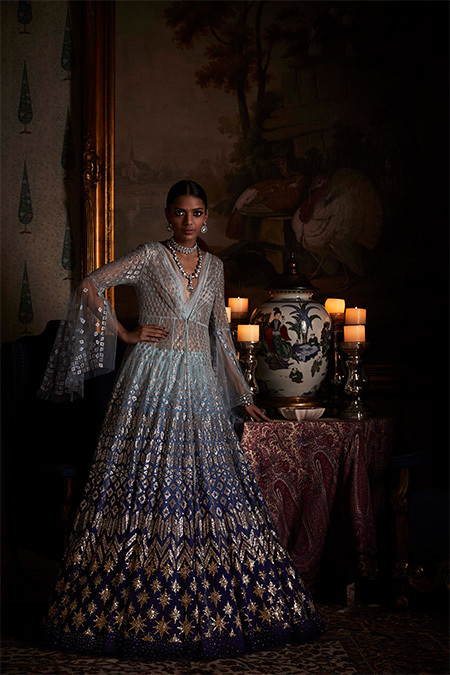 Well, I think it’s very nice that finally a connection is being shown between the Indian textile industry and the Indian fashion industry. 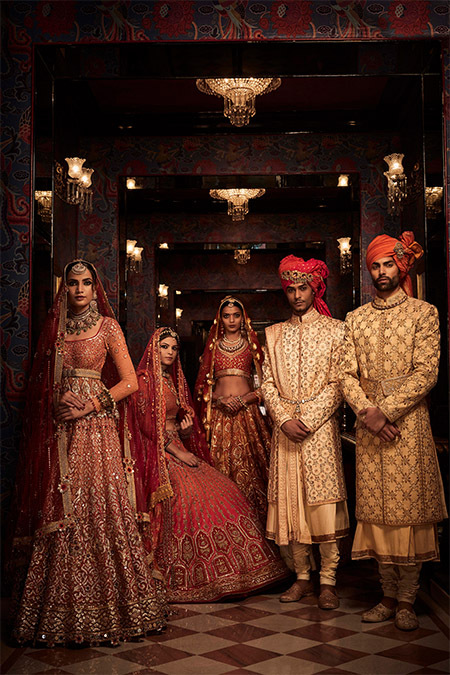 Till 45 years back, the industry was really a textile industry and the textile ministry has always had trouble with the fact that there is a separate fashion world emerging which needs to now be blended in. After all, abroad what is the textile industry without the fashion industry? So I think for me this is a significant coming together, or a collaboration, or an acknowledgement that the two industries are not mutually exclusive and must, in fact, work together for the betterment of this overall textile industry and for the undisputed role that the craftsman has to play in upmarket fashion for this country.